The Bible - both Hebrew and Christian Scriptures - says some really harsh and ugly things. Its pages often display the vindictive and vengeful fantasies of some of its writers. Non-Israelite men, women, and children are slaughtered - and its justified. Non-Christians get obliterated in Revelation dreams of apocalyptic destruction. Genocide is blessed. Slavery is condoned. This is the sacred text we've inherited. It's deeply beautiful, at times, and also deeply flawed. And most of us know it. It seems, though, that conservative methods of reading the Bible have won the day. 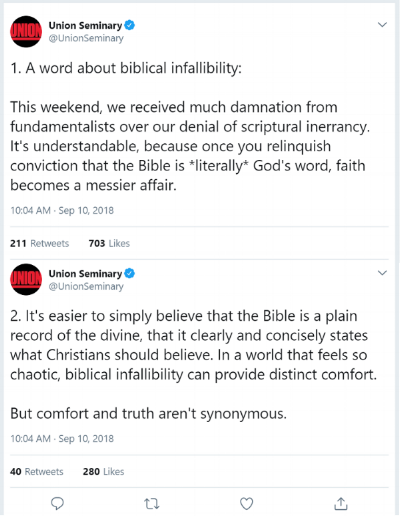 We liberals get sucked into debates about what's "biblical" and what's not. We can't resist the game of who's reading the right passages in the right ways with the right emphasis on the right moral nuance. This is for good reason, especially as lives are on the line, as we currently see at the border and in immigration facilities. Nevertheless, we accept the rules of the game as it's been established for us by those who wish to use it to bless xenophobias of all sorts. I'm not at all convinced that we'll ever win this game. Perhaps, though, winning the day isn't something to realistically be expected. Perhaps vigilance and persistence in liberative readings is the most we can hope for as long as we continue to make this text central to our lives of faith. My point is this. As long as the canon stays the way it is, and as long as the fall continues to structure our individual and communal lives, then the Bible will continue to be quite a rich resource for those who want to use it to visit suffering and oppression on others. We'd be wise to expect this and to be prepared. Rev. Dr. Marc Boswell is the director of the faith-based non-profit, Together for Hope - LA, in Lake Providence, Louisiana. He has lived in the Delta for the past two years and enjoys photography and writing.